"The winged infantry" is to acquire two new vehicles in the form of the BMD-4M airborne combat vehicle and the BTR-MD Rakushka (‘Shell’) universal armored personnel carrier. Not only can the APC be deployed by parachute, it can also ‘swim’ to shore from a landing craft 550 yards out to sea. 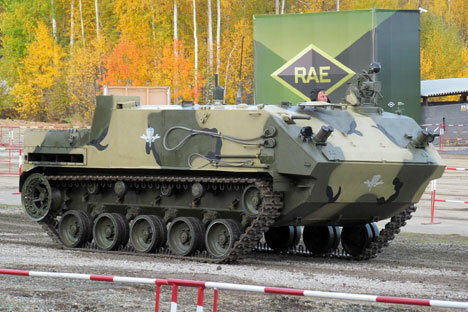 Russia’s airborne forces, whose numbers will be doubled by 2020, are set to take possession of two new vehicles: the BMD-4M airborne combat vehicle and the BTR-MD Rakushka (“shell”) universal armored personnel carrier. The vehicles will be ready to enter service with the armed forces by next spring, when dozens of them will drive through Red Square for the Victory Day parade on May 9, 2015. In the next 10 years the army will buy 1,500 units of the former and 2,500 units of the latter. The Rakushka will become the workhorse of the Russian Airborne Forces, replacing the BTR-Ds that were acquired 40 years ago. The paratroopers have been waiting a long time for the vehicle. The assignment to develop a new line of technology for Russia’s air force was given in 1992, but the project only commenced in September 2009, when a new technological assignment required the modernization of airborne combat vehicles and their use as models for the construction of the new Rakushka armored personnel carrier. The vehicle is currently being tested by the army. Last week the Defense Ministry's TV channel showed footage of its participation in drills involving paratroopers from Tula. The Rakushka demonstrated its capacity to quickly move throughrough terrain, receiving praise from the drivers, who were lucky to be the first to test the novelty. In the video it says that the vehicle was "not created for a frontal attack." It is true that the Rakushka’sarsenal is not impressive: two 7.62mm guns, one of which is installed in the autonomous tower for the command gunner, and the second in the front-left part of the cabin. The purpose of the 13.2-ton armored personnel carrier is to do "household" work: delivering troops to the front line, supplying ammunition and evacuating the wounded. For these objectives the vehicle needs to be fast, have sufficient capacity and to be maneuverable - all qualities that the Rakushka clearly possesses. Even though its designers were limited by factors that required the vehicle to be air-transportable and floatable, they were still capable of increasing its troop-bearing capacity by one and a half times compared to the BTR-D. Now 13 paratroopers can easily fit in the Rakushka's trunk, the crew consists of two people, and the modular design of the inner space allows for attaching stretchers for the wounded and delivering ammunition. The Rakushka uses the BMD-4 chassis, which led to a certain uniformity during production, something that is usually lacking in the Russian tradition of creating diverse multipurpose technology without worrying about the economy of the production. "This is a complete new line of technology destined for the Airborne Forces," says editor-in-chief of the Natsionalnaya Oborona (National Defense) Magazine Igor Korotchenko. "Its main quality is the capacity to transport paratroopers and the ability to work in isolation from the main forces of the Russian army. Here the main thing is its capability to withstand fire from the enemy in a whole range of parameters." The armored personnel carrier is constructed in a way that its engine is located in the rear, the middle part accommodates either the troops or cargo and the control section is in the front. The crew and the troops are protected by welded aluminium armor and two batteries of "Tucha" ("cloud") smoke grenade launchers, which offer the vehicle and troops safe passage out of the combat zone. The paratroopers' seats are attached to the vehicle body's roof in order to protect them should a mine or bomb explode underneath. Also, external air is filtered and the cabin has heating. Not only can the Rakushka be deployed with a parachute, it can also ‘swim’ at a speed of 6 mph, surmounting marine obstacles and disembarking from landing craft in the surf. The vehicle was tested at sea in August 2014 and lived up to its name by not only disembarking on shore through 4-5 point waves, but also by surmounting 3-point waves and returning to the landing craft 550 yards from the shore. The paratroopers who received the new vehicle in June 2014 intend to continue testing it mercilessly until the middle of 2015 to identify its defects and shortcomings. Afterwards, the armored personnel carrier will enter the army. In August 2014, on the eve of the Paratrooper Day celebration, Airborne Forces commander General Lieutenant Vladimir Shamanov announced that by the end of 2015 his troops will receive "two battalions, one with 32 BMD-4M vehicles and the other with more than 20 Rakushka units."